What are the best kids' personalized gifts you can get? The answer in the digital age is both easy and complicated. While it's as simple as a mouse click to get the gift because of online shopping, with so many choices, how do you decide on which gift to buy? The best kids' personalized gifts are usually received shortly after they're born in the form of a baby blanket knitted for them or embroidered with their name. This kind of tradition has been around for centuries, and baby blankets have been handed down from generation to generation. You can still give these kinds of traditional gifts even if you can't make them yourself; many websites offer personalized gifts like embroidered blankets. KookooBearKids is one of the best examples of personalized products for infants and young children. Every gift can be customized with the child's name, and sometimes more, such as pictures and favorite colors. The gifts fall into several different categories. There are keepsakes such as treasure boxes and wall plaques, but these these gifts sometimes fall into the category of those that parents appreciate more than kids do. In the Kids Gifts section you can get more fun items like tea sets, stuffed animals, toy boxes and more, all emblazoned with the child's name. 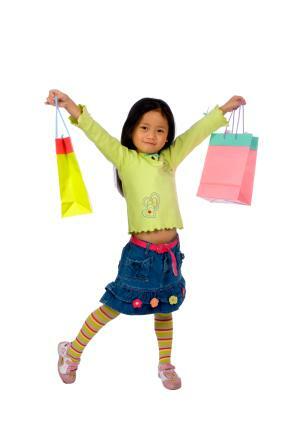 You can also find great gifts for kids on other websites not specifically geared towards children. Personalization Mall has an extensive collection of child-oriented items, including some unusual items like a personalized construction helmet (with a working light) and baker's sets. Frecklebox is a website that has capitalized on the flexibility of digital publishing to offer a remarkable selection of gifts personalized in amazing ways. For example, beginning readers often have books to spell out basic words illustrated with cartoon characters. At Frecklebox, you can get a child a book like that, where the tiny cartoon bugs spell out their own name. Coloring books feature their name, or put the kids into stories with monsters and mermaids. Happy Kids takes this one step further, putting an image of your child's face (which you upload) into an actual DVD cartoon adventure with characters like Dora the Explorer, Spider-Man, Barney, or the Care Bears. Some of them even include the child's name spoken throughout, which makes the gift that much more spectacular. When looking through the extensive offerings on the above sites for the best kids' personalized gifts, keep in mind that what catches your eye may not be what the child wants. The web is filled with ads telling you what kids want or, worse, what's "popular" to get for children. While it's fine to follow trends, it's more important to find out what the child actually wants. Ask parents and friends what the child's been playing with lately, what TV shows they like, what books they've been reading. If it's something they need, find out what colors they like, and try to find something that reflects not only the child's name but their whole personality. This makes the gift not only fun and useful, but also an affirming part of the child's life.